For a complete list of where to buy our products check out our Where to Purchase page. Please E-mail for Wholesale pricing. We follow traditional methods of Tempeh production so our finished product is alive, and refrigerated only has a 5 day shelf life. Keep Frozen until you are ready to use. Our Traditional soy Tempeh has 22 grams of protein per serving and 400 mg of potassium. Black-Eyed Pea Tempeh is very high in iron and makes an excellent alternative to soy. The beans themselves are not as robust, so the Tempeh is a little softer and slightly more delicate. *Limited availability. Currently only available at stores and restaurants in Austin, TX. Garbanzo Tempeh is hearty and dense, but soy-free for anyone who has soy sensitivities. 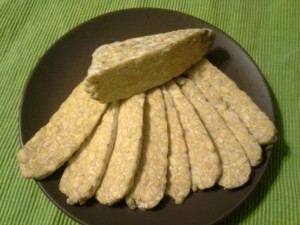 Do not consume raw Tempeh, cook to a minimum of 165 degrees. Mild Tempeh Sausage is great for breakfast, paired with a hash or scramble. It is already seasoned and cooked so all you need to do is warm it up. Sometimes I will stick it in the toaster with a piece of toast and eat it with a touch of Vegenaise and lettuce. Spicy Tempeh sausage is great in breakfast tacos, fried with potatoes, or in pasta! I really like to crumble it on top of pizza with artichoke hearts, sun-dried tomatoes and a bit of basil pesto. It is already seasoned and cooked so all you need to do is warm it up. 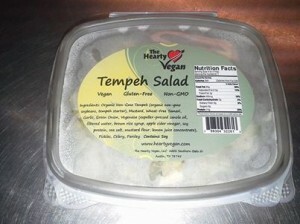 Our Tempeh mock-chicken salad is delicious and ready to eat!